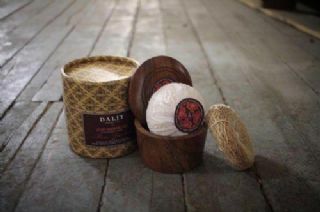 Our wood rosewood bowl is produced by craftsmen in Kerela to perfectly fit our range of handmade soaps makes a great gift and is perfect for our refills. This model comes with a vetivert root skin scrubber and is presented in a luxury tubed Dalit box. Our new range of beautiful soaps are hand made by an all women enterprise in Kerala with a commitment to employing disadvantaged women. Using only 100% natural ingredients these coconut oil based soaps produce a wonderful creamy and moisturising lather being perfect for sensitive skin. In tests our soaps last as much as twice as long as conventional soap. Our wood rosewood bowl is produced by craftsmen in Kerela to perfectly fit our range of handmade soaps makes a great gift and is perfect for our refills. 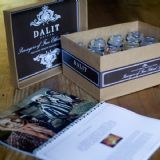 This model comes with a vetivert root skin scrubber and is presented in a luxury tubed Dalit box. Our new range of beautiful soaps are hand made by an all women enterprise in Kerala with a commitment to employing disadvantaged women. Using only 100% natural ingredients these coconut oil based soaps produce a wonderful creamy and moisturising lather being perfect for sensitive skin. In tests our soaps last as much as twice as long as conventional soaps providing excellent value. Of course, all our handmade soaps are free from animal testing.s providing excellent value. Of course, all our handmade soaps are free from animal testing.